The most prominent visual motif in “It Comes at Night” is a red door located at the end of a narrow hallway where it almost always remains locked, the only entrance or exit to the house. 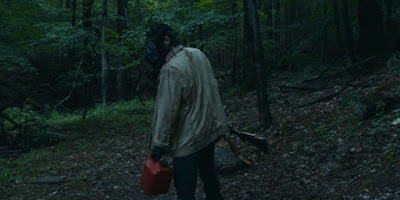 This is protection against some sort of vicious plague that has settled on America, forcing the film’s principal family of three – Paul (Joel Edgerton), Sarah (Carmen Ejogo) and their 17 year old son Travis (Kelvin Harrison Jr.) – to spend most of their time sealed up inside, only venturing outside with gas masks and weaponry. Of course, “It Comes at Night” is a horror movie and so that door will be ground zero for considerable tension, whether from pounding in the night or as a vision in nightmares. Those scares, however, are mostly run-of-the-mill professionalism, the hallway working better as a metaphor for the deliberate narrowness of writer/director Trey Edward Shults’s vision. He has no interest in exploring the finer points of the plague, leaving its origin and exact effects vague, where even the people on screen don’t know what’s happening, while also reducing the aim of nearly all his characters to the most elemental – that is, surviving. Shults lays out the stakes concisely in the opening shot, his camera trained on an older man, clearly in the final descent of a painful, disease-ridden death, before sliding the camera around and to the right, bringing Sarah, the man’s daughter, into the picture, where she wears a gas mask and says her goodbyes. Even if the precise details remain unclear, this shot nevertheless makes us privy to the essential information, while also making clear from the get-go that that this is a movie where the lives of loved ones will not be spared by narrative tricks. More than that, these two shots, and an ensuing one, where we see Travis’s reaction after his grandfather is put out of his misery, underscores how every person in this strange new world is emotionally left to fend for his or herself. Shults contrasts that with scenes at the dinner table, often set in wide shots, so we see everyone together, though a later monologue by Paul makes clear this together time is by decree as much as by choice; you only stay together by forcing it. That insistence will be explored even further when another family of three arrives, which occurs after Will (Christopher Abbot) tries to break through that red door, thinking the home is abandoned, claiming he only wants supplies for his wife and son. It’s tough to know if this is true, ably captured in Joel Edgerton’s performance, simultaneously conveying that he does not believe a word Will says and that he wants to believe every word Will says so much. Sarah prods and eventually they let Will and his wife Kim (Riley Keough) and their young son Andrew (Griffin Robert Faulkner) move in, where a concise montage initially establishes everything as peachy keen, or as peachy keen as it can be given the circumstances, before an event, one that does not feel properly foreshadowed, merely dropped in to incite the climax, drives a wedge between them. Despite Edgerton’s effective stoicism neither his character nor Abbot’s possess much dimension, and neither do the wives, with only Keough’s performance exuding any kind of life beyond the frame. Then again, this lack of dimension is part and parcel to the story’s deliberately limited focus, eyes on survival, nothing else. The only character into which Shults digs is Travis, which is by design. This may be a plague-filled Earth but he’s still a teenager, and teenagers still have to grow up, and as Emma Stone’s Wichita once opined, it’s tough growing up in Zombieland. Travis fills sketch pads with feelings that have nowhere else to go and he sneaks up to the attic to eavesdrop on conversations echoing through the walls below, the latter planting a story seed, yes, but also nicely evoking his yearning for conversations he can’t otherwise have. That’s why perhaps the most moving scene in the movie is a conversation at the kitchen table with Kim that, frankly, could have gone on longer, where he twitches with a humanity he struggles to understand and that will be put under the microscope in the film’s climax. What is perhaps most interesting about “It Came at Night” is how rooted we are to Paul, Sarah and Travis, allowed only one scene alone with the other family, though even that is primarily seen through the eyes of Travis, listening in the attic from above, and yet how as suspense ratchets up, you, like Travis, almost involuntarily feel your allegiance shift, even if you can simultaneously understand the decisions driving Paul and Sarah. 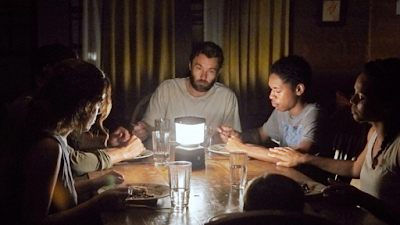 It is not a conclusion opting for the easy way out, which is ultimately what’s scariest about “It Comes at Night”, more than any loud noise at the end of the hallway, how living to see another day might not mean all that much if you can’t be with the ones you love. I saw this movie recently! I liked it!